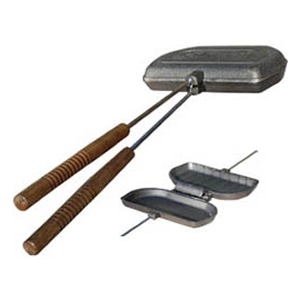 Enhance the versatility of your wood fired pizza oven with our Panini Press. Making authentic Italian style pressed sandwiches over an open fire is a breeze. Unlike other presses that only crimp the edge of the bread,our panini press is designed to evenly toast the entire sandwich. Creating the best pizza on the planet is only scratching the surface of what you can cook in your wood fired oven. The panini press is a perfect example of this. This press is a great tool on so many levels,like making a simple prosciutto and gruyere sandwich cut into small bites and served as horderves. This is a safe and surefire way to get the kids interested in cooking! Let them make their own grilled cheese sandwich and cook it in the wood fired oven. Set up a sandwich bar and let your guest create their own masterpiece. Not only great for use with your wood fired oven, but also works great with your BBQ or campfire cooking. Made from durable cast iron, our panini press is easy to clean, and able to perform extremely well with high temperatures, includes 16″ handle.